A funny noise, is something you never want to hear coming out of your primary disk drive. If you are like me, you probably never think too much about backing up your important data before it becomes a looming emergency. I realized while listening to that noise, and watching the red HDD indicator light stay on constantly that I had some pretty important stuff on that drive. Wedding photos, baby photos, videos, documents and other things that you can’t just re-download. Why not have cloud backup? I’m a bit skeptical of entrusting others with my data. At the end of the day, a failure on their end may net you a refund, and you could even take them to court, but no matter what, you are never getting that content back. It was time to take matters into my own hands. The Setup: I bought a two-bay D-Link DNS-320, and two Western Digital 2TB Red hard disk drives. The plan was to setup the disks in RAID 1, so the odds of a simultaneous failure were as statistically low as my finances would allow. I liked the D-Link 320 because it had compelling features, and a two drive system for a fraction of the cost of other names like Synology. I wanted CIFS and NFS sharing, and RAID 1. Everything else was a perk. Pleasantly enough the DNS-320 also comes with a UPnP server, and has some nice SMART monitoring options, which will send an email to me in the event that errors are detected. I would create one 2TB partition out of the disks, and share this over the network with restricted access. My wife and I would both be able to connect from our computers to back up any data we wanted. Configuration: CIFS setup was a breeze, but NFS required a bit more poking around. This post is dedicated to overcoming some of the issues I had. Within the NAS web interface, partition your drives, and grab a cup of coffee. Straight forward stuff. I created a single partition labeled “Volume_1”. After this is complete, go to “Management” -> “Application Management” -> “NFS Service”, and check “Enable”, then click “Save Settings”. Go into “Management” -> “Account Management” -> “Users / Groups” and create a user account if you have not already done so. Within “Account Management”, click on “Network Shares”, and click the “New” button. This will launch the wizard for setting up a share. Select the appropriate users, groups, settings, and on the “Step 2-1: Assign Privileges – Access Methods”, ensure that the “NFS” checkbox is checked. Move along by clicking “Next” until you reach “Step 2-1-2: NFS Settings”. You will need to specify the Host IP address of the client that will be connecting to this share. This will white list the IP address supplied as a client location. I’m not positive what format you would use the denote multiple IP addresses, however, an asterisk character allows all hosts. I connect with multiple machines via NFS, so using a particular IP address is not sufficient. Despite being accessible to any IP address, the client will still need to authenticate using their credentials entered in “Step 1” and “Step 1-2”. I consider this good enough. Also, ensure the check the “Write” check box if you wish to be able to write files to this location. Client Configuration: You will need to install the nfs package for your distribution of Linux. I am running Ubuntu 12.10, so the package is named “nfs-client”. Install it using “sudo apt-get install nfs-client”. Now that you have the nfs-client package, you can use the “showmount” utility to list the shares on the NAS device: “showmount -e NAS_IP_ADDRESS” (e.g. showmount -e 192.168.1.1″). Depending on how you have the disks partitioned and shared in the NAS device, this path will differ. This path should be consistent with the information in the “Network Shares Information” dialog. 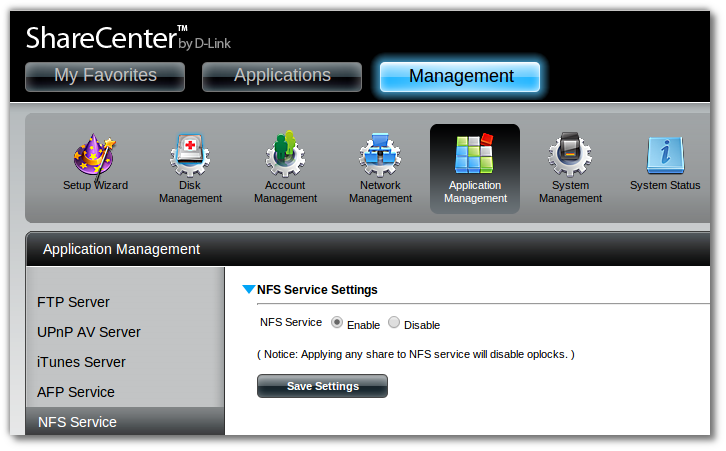 This can be accessed by clicking the magnifying glass icon underneath the NFS column in the “Network Shares” interface. You can now mount your device using the “mount” command: “mount -t nfs NAS_IP_ADDRESS:/REAL_PATH /path/to/mount_point“. The NAS_IP_ADDRESS is the IP address of the NAS device. The REAL_PATH is the information obtained either via showmount, or the “Network Shares Information” dialog. The “/path/to/mount_point” is just an empty directory somewhere on your local machine. The values used are identical to the values used in the mount command preceding this example. The options specify changes to the mount behavior. “rw” specifies “read/write” permissions. “hard” retries requests indefinitely. Coupled with “intr”, this allows requests to retry until the NFS server becomes unreachable, in which case the retries would stop. I would recommend these option when copying large amounts of data, or when on a wireless network as failed transmissions will be silently repeated without raising an exception on temporary timeouts, etc. Note on Permissions: Initially when I copied my content over to the NAS, I did so via NFS, and I was not able to view the contents via CIFS (Windows sharing). The problem came down to permissions. The directories did not have a executable bit set for “other”, so permission was denied when a request was made to show the contents of a directory. This was difficult to locate as the UPnP server showed all my media without any permissions issues. A quick search of UNIX permissions revealed that the executable bit is necessary to list directory contents, and the NAS is accessing content created via NFS as “other” (neither user, nor group permissions apply). You can recursively grant the execution bit of any existing content by issuing the following command from the top directory: “chmod o+x -R /root_directory“, where “root_directory” is the folder you want to change. The “-R” flag will recursively apply this permission to all content within. Lessons Learned: I have about 50GB of pictures and video, and another 20GB in purchased content. I underestimated how long this would take to transmit on a 802.11g connection. 54Mbps is just under 7MB/s. This means that a 50GB transfer would take over 2 hours to complete. And that is not counting temporary speed drops, hard drive access times, retries, etc. When working with large amounts of data, I recommend a 1Gbps Ethernet connection. I will probably be investing in a new router soon that can accommodate these higher speeds. 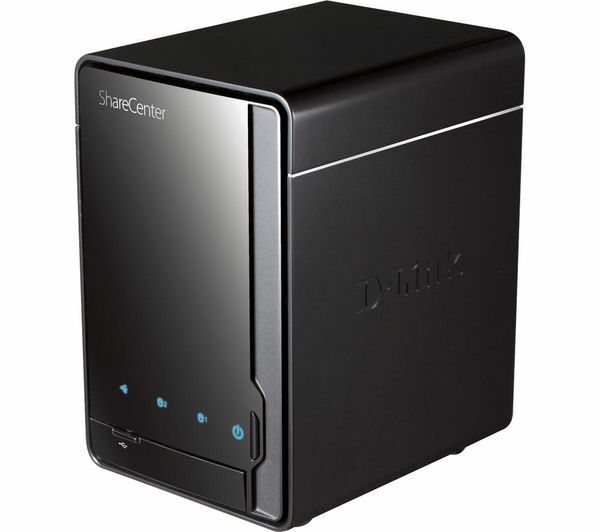 The D-Link DNS-320 is a solid first time NAS device for under $150. Other than a few gotchas when setting up the NAS (most self inflicted), this device is NFS friendly, and has made a fine edition to my hardware ecosystem. The format for multiple addresses is “192.168.1.5,192.168.1.6,192.168.1.7” (etcetera). You specified “nfs” as the file system type in your fstab. That’s going to do a scan on the remote host to see what types of NFS it supports (e.g. “ rpcinfo -p 192.168.1.2 | grep nfs” if 192.168.1.2 is your NAS). In my experience, version 3 is going to be chosen over any other unless you explicitly state the version. Only version 4 supports remote credentials, and it’s a pain to setup (the uid and gid between systems needs to match or you have to setup a wacky map). Which is to say, the way you have things configured, clients on your network do not need a username and password to access your NFS share. You should limit the IPs. You can specify a range with the subnet mask notation for hosts, such as “192.168.1.0/24” (without the double-quotes). This will allow all local addresses between 0 and 255 for the last part of the address. Many, MANY thanks to both you Ben and James Sumners for putting this together and the additional information! With this guide I managed to get my DNS-320 NFS up and running in under 3 minutes!